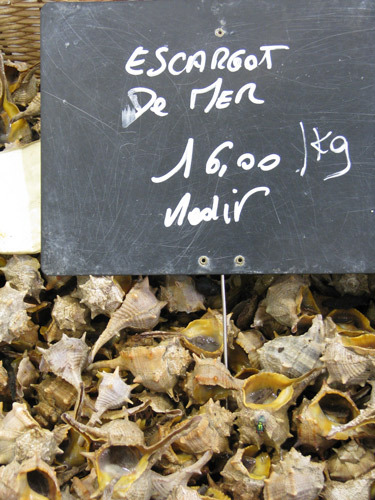 Yesterday it was frog's legs and today it's escargots - snails! I had a giggle when I realised I could complete the set of unusual things the French are renowned for cooking. 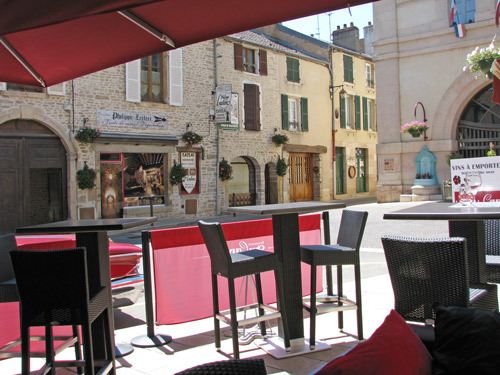 After my dinner of "brown food" on Saturday night I continued north through Burgundy in central France and had a very fine and appetising Sunday lunch on 3rd July in the red splendour of the terrace parasols at a restaurant called Chez Guy in the centre of the village of Gevrey-Chambertin. 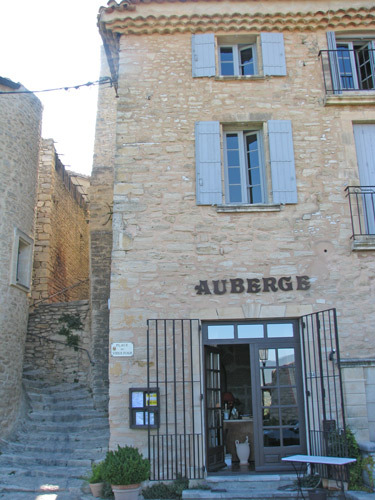 I remember when I first started travelling through France being absolutely amazed at how the names of wines which are well known all over the world often relate to what turn out to be small villages in France - completely surrounded by vineyards. 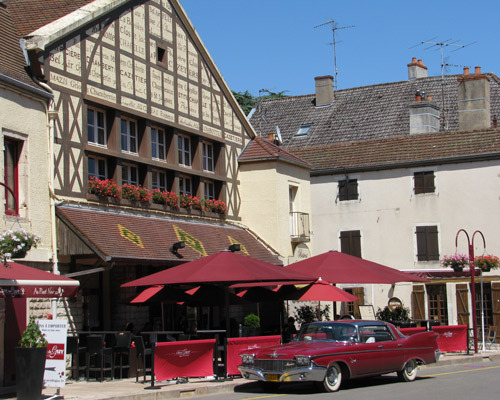 Gevrey-Chambertin is one such village on the Côte de Nuits in the northern part of the Côte d'Or which is worth driving down if you ever get the chance - I did a special detour to do so! More about the village and the wine at the end of this post. 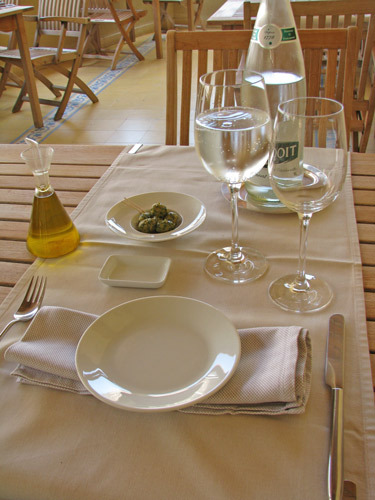 The restaurant offers a number of options depending on how many courses you want to eat. 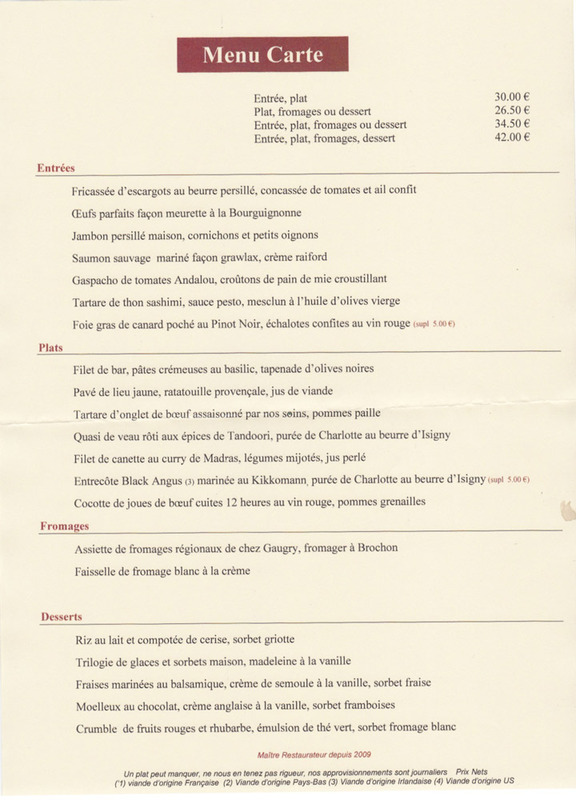 I had the Menu de Carte (Entre, Plat, Fromage, Dessert) - partly because one of my delights is to eat good French food and partly because the aim of the exercise was also to give me a good break in the middle of a long day's drive. I hasten to add I had a very light meal when I got to my overnight stop at Epernay! As I was in for the long haul I ordered a Sarah inspired Suze and tonic to drink while I read the menu and drank Badoit over lunch. Such a sin to come to a restaurant in the middle of such good wines and have no wine to drink - however I was driving - c'est la vie! The Menu is in French however I got some help from the staff who were a lot friendlier than my experience the night before. (Bottom left) Fricassée d'escargots au beurre persillé, poêlée de girolles, sauce pesto (Fricassee of snails in herb butter, sautéed mushrooms, pesto sauce) All I can say is snails are yummy! (top right) Filet de Bar, pâtes crémeuses au basilic, tapenades d'olives noires (Fillet of Sea Bass, creamy basil pasta, black olive tapenade) - a bit odd to choose fish on a Sunday in the middle of France however, while I wanted to enjoy my meal I was leaning towards the lighter courses so as to avoid feeling too sleepy after lunch! (centre bottom) Assiette de fromages régionaux de chez Gaugry, fromager à Brochon (Cheese platter with regional Gaugry, cheese Brochon) - this was a good range of local cheese served with decent bread. The cheese was served on wood from a crate of local wine which added a nice touch which was only slightly cheesy! (Bottom right) Crumble de fruits rouge et rhubarbe, emulsion de thé vert, sorbet fromage blanc red berry and rhubarb crumble, emulsion of green tea, cottage cheese sorbet - a very light and refreshing way to end the meal. My notion of cooks having preferred colour palettes is further upheld. This one is a lot more colourful with ample doses of red, creamy yellow and green. My bill including my suze aperitif, bottle of Badoit and a coffee at the end came to €52.50. 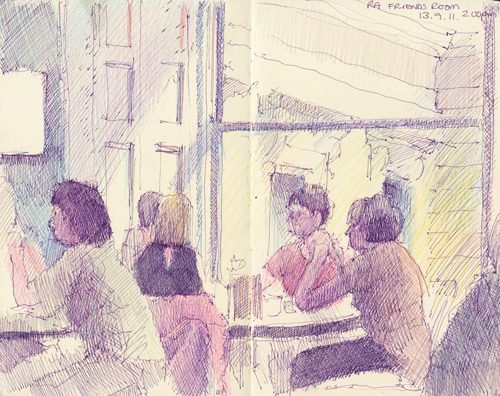 I did tackle a second sketch of my view, however - unlike Saturday night - I was so interested in the food that it hardly got a look in and is unfinished. So here's a photo of the view from my table - taken at the end of the meal when the people at the other tables had left. I sat on the outside terrace at the front of the restaurant, underneath a huge red parasol which provided good shade but cast a red tint over everything! Trying to determine the colours of my meal was interesting and the photos are of no help at all! It had to be done while I was there. 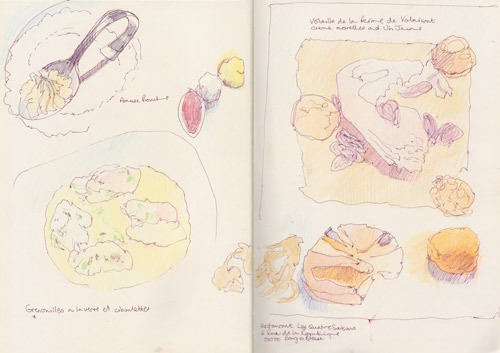 Hence the white dish of snails does not have the red colour cast it had while I was drawing and eating them. This is a photograph of Chez Guy complete with an amazing vintage Cadillac with enormous fins - painted dark pink - which turned up towards the end of lunch, parked right outside - on the bit which I thought appeared to indicate 'no parking'! Out trooped a rather larger than life middle aged 'guy' and his large entourage which included children. He was obviously well known at the restaurant and I spent my dessert and coffee wondering whether he was the owner or a local rock star with taste. I'd definitely recommend this restaurant to anybody passing through the area - however do book ahead and arrive in good time - unless of course you're a passing rock star of repute! Gevrey-Chambertin is located in Burgundy. It's located on a limestone ridge about 12 km south of Dijon and about 30km north of Beaune. 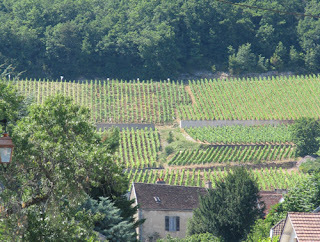 The village has just over 3,000 inhabitants and an awful lot of vineyards. Its inhabitants are called Gibriaçois. There are 550 hectares of vine "Pinot Noir" on a gentle slope which lies to the east of the wooded limestone ridge. This area has nine Grands Crus (the highest level of classification of AOC wines from Burgundy) which lie to the south of the village and 27 Premiers Crus which mainly lie to the west of the village. The best wine lies close to the limestone at the top of the slopes while the more ordinary wine which can also be labelled Gevrey Chambertin is on clay soil in the valley bottom. 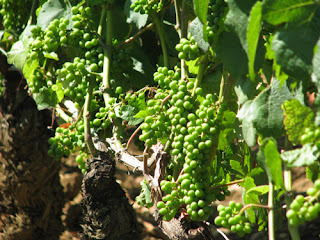 It seems likely that the very first vines planted in Burgundy were planted at Gevrey Chambertin. There's evidence from archaeological digs that there were Gallo-Roman vines planted in the area dating back to the 1st Century BC. Pliny the Elder wrote about wine in this area! 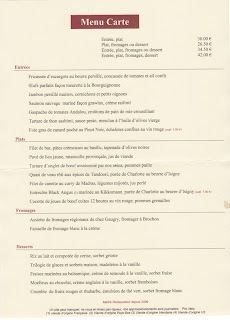 Dinner at Les Quatre Saisons in Bourg en Bresse was interesting rather than pleasurable. I felt a little bit like I'd stepped into a 1980s time warp as I don't think the restaurant had been decorated or had a makeover in a good 25 years. 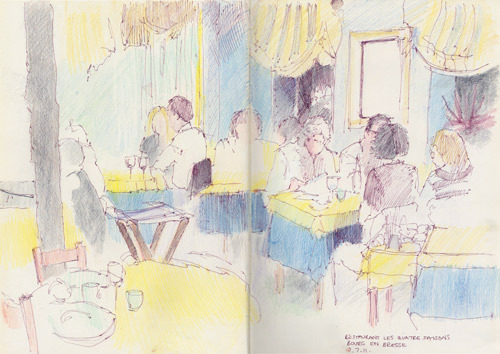 On the other hand the bright yellow tablecloths and blue walls made for a colourful sketch and made up for the fact that my meal seemed to lack any colour at all. The chef contributed yet more evidence to my theory that chefs cook the food in the colours that they like. This chef liked brown. See my sketch of my meal below. (top left) an Amuse Bouche I have absolutely no idea what this was! (top right) Volaille de la Ferme de Valaisant, creme morelles and Vin Jaune - this should have been tastier than it was. The worst bit was that the fact that there was nothing that made it look appetising - wall to wall bland! (Bottom right) I think this was a Tarte Tatin with a very ordinary ice cream but forgot to make a note of the dessert having become totally disinterested in the food by this stage. Lack of colour is a real turn off for me. 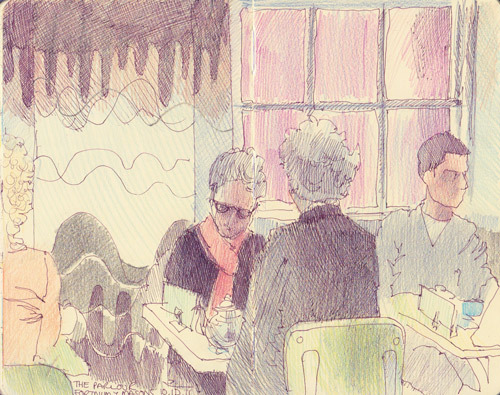 I'd switched my focus to my sketch of the interior which was Bright with a capital B! 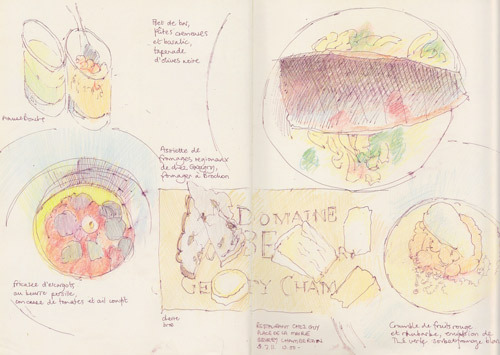 You can always tell how good the food is by the relative merits of the sketches of the meal and the place where I ate it! (centre) The only spot of colour came with the petit fours! 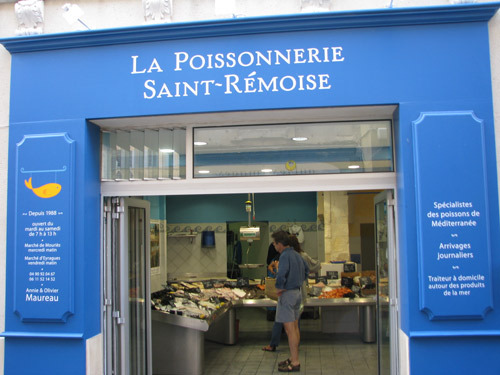 My own impression was that the restaurant would be fine for people who spoke French well, liked a more traditional French way of cooking food and enjoyed discussing the food. My French is limited and their English was virtually non-existent. With no translation on the menu or from the waiter I had a rough idea what I was eating. It's probably more accurate to say I had to opt for courses where I had an idea of what it was. I'm not sure a single woman who doesn't speak much French was very interesting as a customer to them. That's said in the context of having been in other restaurants in France where I've been very well looked after and had an enjoyable time despite the language barrier. However this was in Bourg en Bresse which is not a tourist destination and it would be totally unreasonable of me to expect restaurants to cater for English tourists. A shade more hospitality wouldn't have gone amiss though. More colour in the food would have been even better! The whole meal (including coffee but without wine) came to €42 which I thought was a bit steep. What's really odd though is that my two worst meals of the entire trip were a short distance from Lyons which is supposedly the gastronomic centre of France. Very odd. I went to bed very much looking forward to my lunch the next day in Gevrey Chambertin in the Côte de Nuits in the northern part of the Côte d'Or, which is home to the vineyards which line the limestone ridge that is at the heart of the Burgundy wine region. One of the things I really enjoy about France is that you can go into a restaurant - on your own - for a four course meal like the one that you can see above - and nobody thinks you are the slightest bit odd. 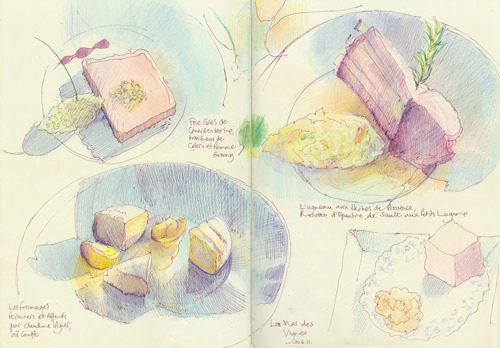 However they might look twice when you pull out a sketchbook and proceed to sketch every course before you eat it - but that's what I like to do! 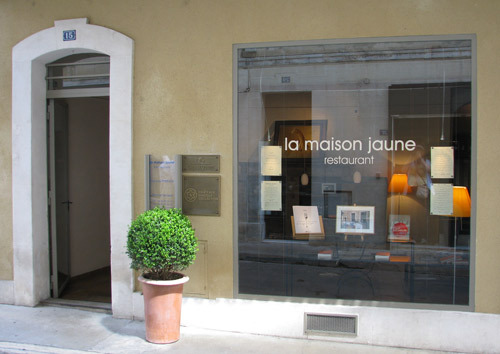 I particularly like going to restaurants with Michelin stars and it's an absolute rule of mine that I'm not allowed to visit France without eating in a restaurant with at least one Michelin star. 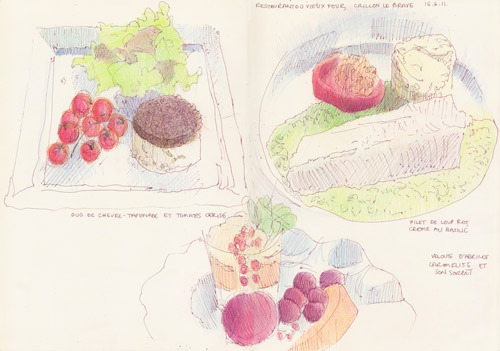 This is out of sequence re France but as I said this week I'm trying to get all my sketching of meals posted before I do my review of the year! Back to 29th June - Sarah and I got up early so we could leave the house at 7am and get Sarah to Marseilles Airport by 9am for her flight home. And then there was one! Those who know me well will know that one of my perennial preoccupations while travelling and sketching is with visiting the places where people draw or painted. That was the grand plan for this Wednesday. 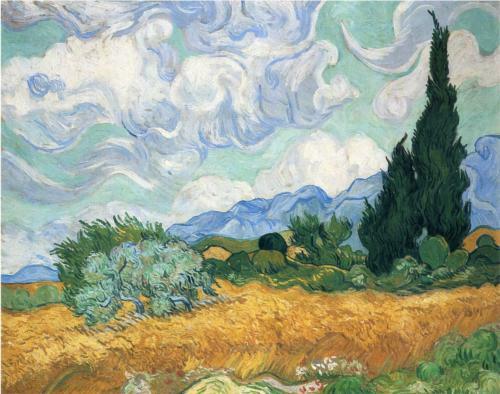 I was to have a Vincent Van Gogh in Provence day with a nice lunch in the middle. I'd already decided that it was stretching it to try and do both Arles and Saint-Rémy-de-Provence in one day so I opted for Saint-Rémy this visit as I'd been to Arles on a previous visit. 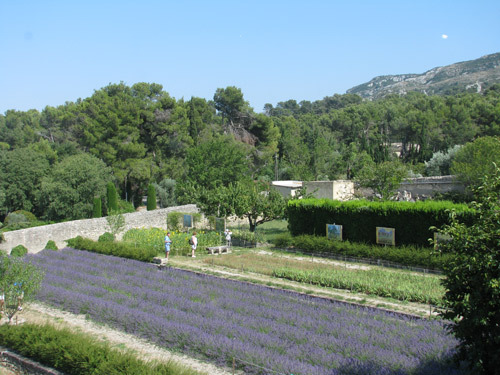 Hence the plan was to drive north from the airport, across the Crau Plain and the Alpilles to the town of St Remy de Provence where Van Gogh was committed to an asylum in the Monastery Saint-Paul de Mausole in 1889. He painted frequently in the vicinity of the hospital in the year or so he was in the hospital. I wanted to drive across the Crau Plain because this was the place where Van Gogh did so many of his reed pen drawings of the farming of the countryside which I so admire. I wanted to see if it was as I remembered it and whether one could see its potential for drawings. Here's an example - Harvest - The Plain of La Crau, 1888 reed pen drawing by Vincent Van Gogh - done while living in the Yellow House at Arles. No sketches or photographs en route from either of these places as the road was not conducive to stopping - however as you can see I could take photos of the Alpilles from the Monastery. 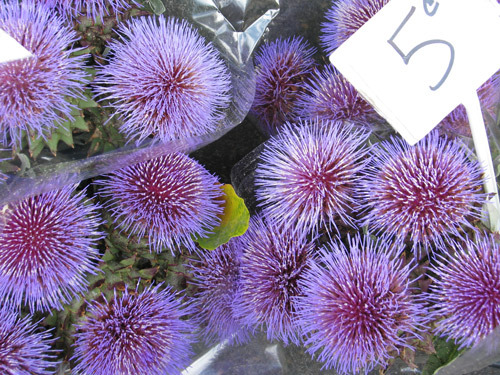 One of the reasons I chose St Remy was because it was market day (closing at lunchtime). 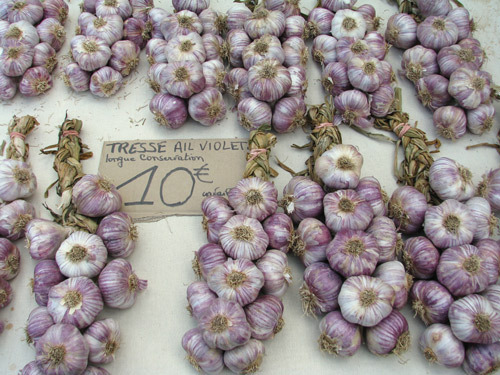 I visited the Market, took lots of photos of yet more provencal food and flowers, had a lovely lunch (see sketch at top of post), visited the Van Gogh Museum in town and then visited the monastery hospital, St Paul de Mausole where Van Gogh lived for a year after becoming ill in Arles. I'm going to deal with the visit to the Monastery in another post - so this is all about markets and food! Here are some of the sights of the market. Then I'm going to give you the menu for lunch. and so to the tasting extravaganza I had planned for the middle of the day. I got to sit on a shady terrace with a tiled roof slight breeze in the hottest part of the day as I worked my way through five courses and listened to the market packing up - and then music being played down in the square. It was very peaceful. Roast Pigeon with Apricot Chutney Marmalade with a side dish of Fennel and Fresh Almonds - this was beautifully cooked and a wonderful balance of flavours, Plus since I watched Masterchef recently I now know how fresh almonds are prepared! a selection of fresh and aged goats cheeses and ewe cheeses and rhubarb marmalade - I like goats cheese but there wasn't quite enough of a variation for me to make this the same standard as the rest of the courses. Subtle rather than wow! Roasted Pineapple with ginger and vanilla, an amaretto granite and nougatine This was wow! the variation in the tastes and textures was amazing and provided a deeply satisfying note on which to finish. 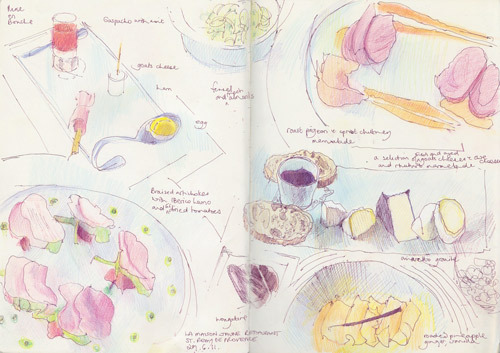 I was also rather pleased with the fact that I'd left enough room to get the whole meal on one double page spread. No mean feat when you don't know what's coming or what it will look like! The restaurant is closed December and January. Note: Parking is in designated areas and the town is very busy on market day and it can be difficult to find a place to park. The restaurant is right in the centre of the old town. Hence if visiting one needs to park up and then walk to the old town - it's not far. I was late sending this to Alyson and then she was away in Australia when it arrived - so this has been posted a little bit later than usual on A Postcard from my Walk blog - as my postcard from a walk in October. 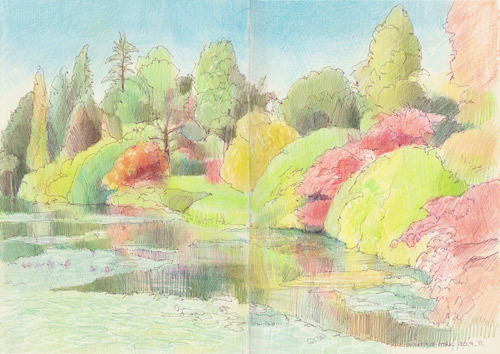 I can see I'll be visiting more often now that "he who must not be bored while I sketch" has declared Sheffield Park to be one of his favourite places! All I need to do now is take my pastels next time! 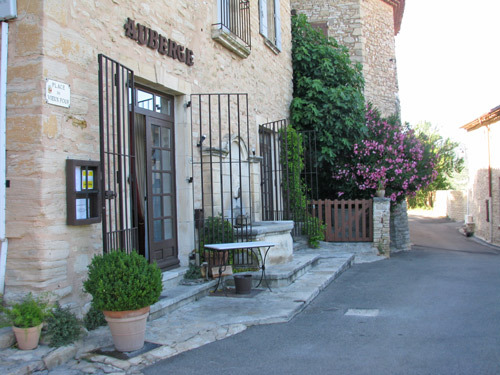 The first time we went to the Restaurant du Vieux Four in Crillon Le Brave was for Ronelle's (African Tapestry) last dinner with Sarah (The Red Shoes) Robyn (Have Dogs, Will Travel) and myself. It had a real colour theme of red, green and white and prompted me to think some more about about cooking and colour. As you can see we were taking advantage of the opportunity for terrace dining at this Restaurant which is situated on the edge of the ramparts of this hilltop village. 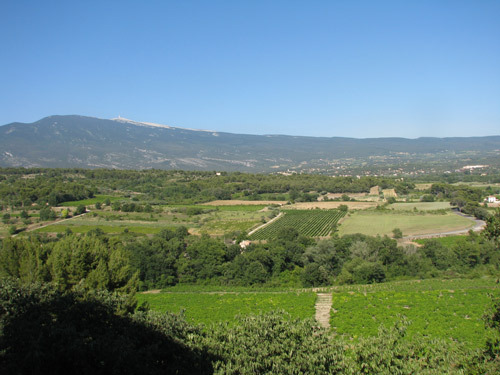 We had a fabulous view of the countryside between Crillon le Brave and Mont Ventoux - and where we were staying just outside Bedoin. you need to note that it's cash only. On Sarah's last night we dined there again and we realised too late that we hadn't got enough cash on us. Fortunately, the restauranteur remembered us from this meal, knew Julian and trusted me to go back the next day and pay her - which, of course, I did. driving and parking in Crillon Le Brave can be a bit of a challenge, especially for those with large cars. It's worth taking a look at the narrowness of the streets, the angle of the turns and the incline down to the arch in the walls out to the street before you drive past the restaurant to leave Crillon le Brave. Having to do a three point turn to turn a corner at a lateral incline of 45 degrees on cobbles is a bit of a challenge - believe me! Much better to park at the car park at the top of the village and walk down and back again. This is the easy bit - the difficult bit with the incline and the corner is behind me! Crillon Le Brave is an ancient village is situated high on the hill in the Vaucluse. This was a defensive position which dates back to its origins in Roman times when it was known as Crillonium. It developed further in the fourteenth century and was ruled by the Dukes of Crillon up until the French Revolution. It had a significant population and was prosperous in the nineteenth century but fell into decline in the twentieth century. Houses which have become ruins are still evident in some parts of the village. It is now dominated by a high class hotel which seems to account for many of the buildings in the village. Those who have read Cherries from Chauvet's Orchard by Ruth Phillips (Meanwhile) will know that Crillon Le Brave is where Julian Merrow Smith (Postcard from Provence) lived when he first came to Provence to become a painter. It was fun trying to work out where the very first studio was located! This book tells the story of Postcard from Provence from the perspective of the artist's wife and partner. It's a definite "must read" for all followers of Postcard from Provence and aspiring daily painters. 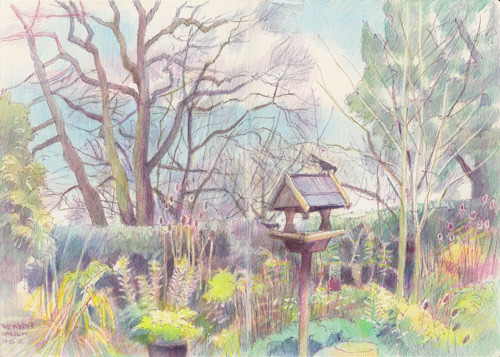 Continuing my series of sketches of my mother's garden in Cheshire - this is a sketch of the Winter Garden done this last weekend. I was rather surprised by just how much colour there is in the garden in winter. Could be something to do with what my mother has planted over the years of course! 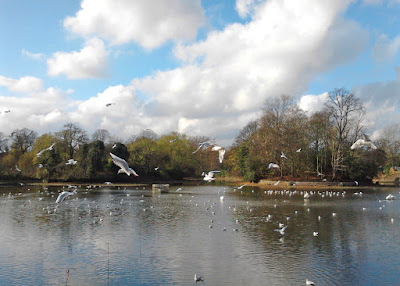 At long last, after far too long, the water and birds are beginning to return to the West Lake in Victoria Park in East London. The swans are back as are are the gulls and the geese - but there's no sign yet of the ducks or the coots. 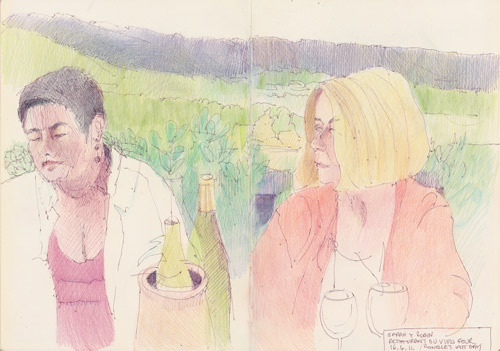 I sat at the balcony at the Pavilion Cafe last week, ate a veggie brunch washed down with a mug of builders tea, and sketched plein air the view that I've often drawn before. The water level is at a stage where the birds give a very good imitation of walking on water. Apparently it's going to take 12 weeks for it to fill to the level it should be. 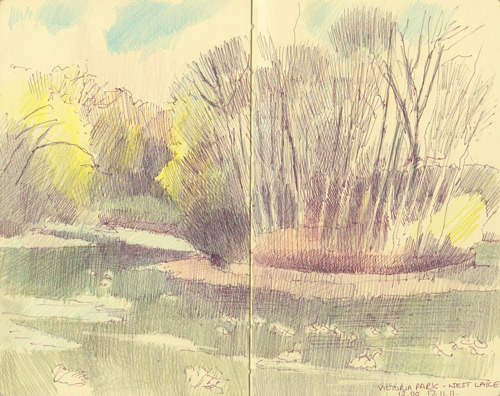 The sun came out as I sketched and, of course, changed all the colours! Below is a photo of the birds after somebody dumped some bread into the water right next to me! 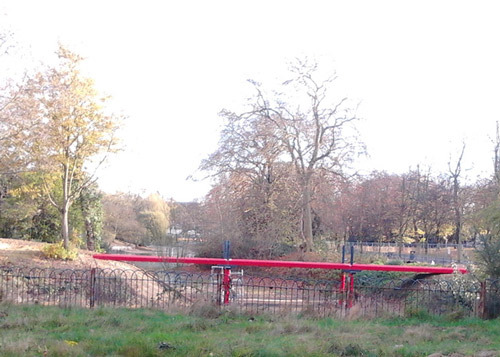 Victoria Park - beached and neglected? 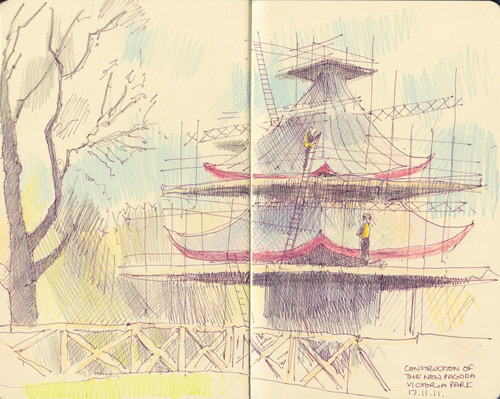 The construction of the Chinese Pagoda is currently underway - along with the new Chinese Bridge. It's a lot smaller than I was expecting (see The Pagoda at Kew Gardens - I go to Kew Gardens a lot!) - but read on and you'll find out why it is designed as it is. It's been built on the reclamation of one of the original islands in the Lake - and having created a new island, it's also getting two new bridges as well as a Chinese Pagoda. One is rustic and the other is going to be decorative metal painted in red. It also seemed like a jolly good time to do a sketch of it! 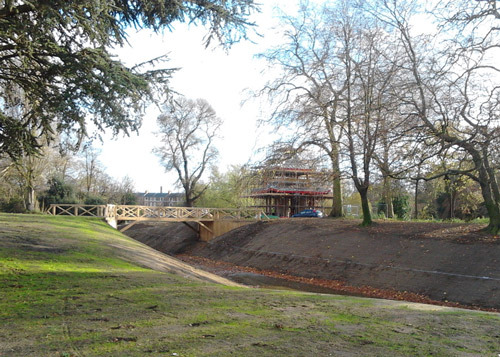 What's a Chinese Pagoda doing in an East End Park? Well it's certainly not a silly question! China opened up to the west during Queen Victoria's reign however there were still some considerable tensions - the first Opium War for example only finishing in 1842. The following are some comments on the original Chinese Pagoda which was originally built as an entrance to the Chinese Exhibition in Hyde Park in 1842. Below are extracts from documents on the Internet - and it seemed like a good idea to record them alongside the building of the new Pagoda. They explain why the pagoda is shaped as it is. Upon the left-hand side of the inclined plane, extending iron Hyde Park Corner to Knightsbridge, and towards the extremity of St. George's Place, a grotesque erection has lately sprung up with all the cupidity which distinguishes the building operations of the present day. As the work proceeded, many were the guesses at the purpose for which it was intended; and, to feed the suspense of the many thousands who daily pass this thoroughfare, the work was covered with canvas until just completed. The structure in question is the entrance to an extensive apartment filled with "curiosities of China." In design this entrance is characteristically Chinese, and is taken from the model of a summer residence now in the collection. It is of two stories, the veranda roof of the lower one being supported by vermilion-coloured columns, with pure white capitals, and over the doorway is inscribed, in Chinese characters, "Ten Thousand Chinese Things." Such summer-houses as the above are usual in the gardens of the wealthy, in the southern provinces of China, often standing in the midst of a sheet of water, and approached by bridges and sometimes they have mother-of- pearl windows. Although the above building in raised from the pathway, whence it is approached by a flight of steps, it is somewhat squatly proportioned. But such is the character of Chinese buildings, so that when the Emperor Kesen-king saw a perspective view of a street in Paris or London, he observed, "that territory must be very small whose inhabitants are obliged to pile their houses to the clouds;" and, in a poem on London, by a Chinese visitor, it is stated,- "The houses are so lofty that you may pluck the stars." The mysterious structure which had attracted such curiosity was a replica of a Chinese summer-house or 'pagoda' at the corner of the way in to Old Barrack Yard (Plate 6a). This arresting object was the entrance to an exhibition of Chinese art and artefacts known as the Chinese Collection, which had opened to the public on 23 June. (ref. 43) The exhibition itself was in a new building back from the main road, and the pagoda, designed after a model in the collection, served both as a ticket-office and way in to the exhibition hall, which was reached up steps and through a vestibule or covered walk at the rear (Plate 11a). I'm now wondering what sort of decorative finishes our new pagoda is going to have. pen and sepia ink and coloured pencils, 11" x 16"
One of our Indian Summer Jaunts at the end of September was down to Great Dixter in East Sussex to see the garden in late summer. We let the satnav do the navigation and ended up having a delightful journey across Kent and East Sussex which I'd never have done if trying to read a map (The other half isn't wonderful at reading maps so we've always taken main road routes hiterto). We got there at lunchtime and sat and had our sandwiches while sat in the Sunk Garden next to the Barns. 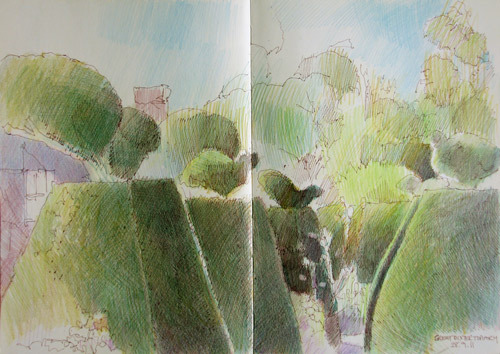 Then took a leisurely trip round the garden to see what had changed before I started the sketch at the top of the post. The original plan had been to sketch the topiary birds in my Moleskine A4 sketchbook to see how they worked and then sketch them again for "A Postcard from my Walk". The sun had other ideas! 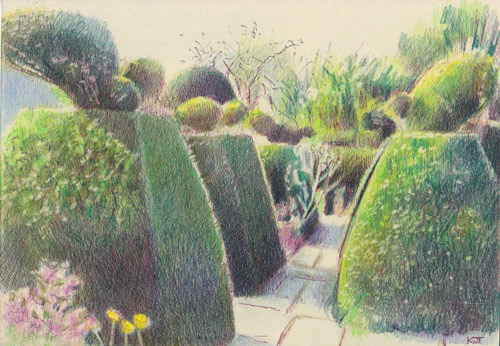 So my sketch for the postcard had to be done at home based on my sketch in the garden - which in turn also had to be finished off at home re the dark tones at home as it takes forever to get the right dark green. 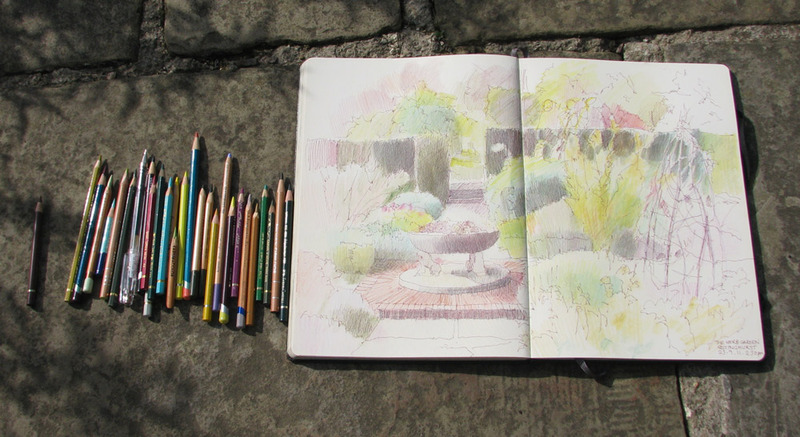 The trick is to do a bit in the garden and then know how much more needs to be the same colour to complete the sketch! 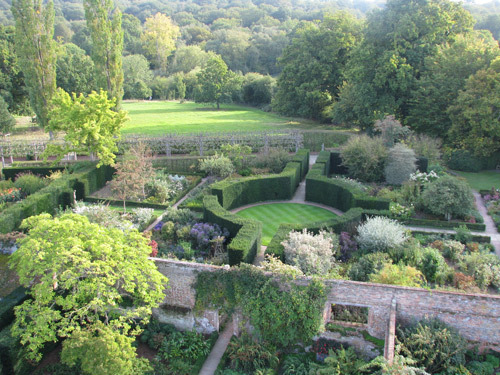 The garden is now closed but opens again in April next year. It's one of my favourite gardens and is definitely worth a visit if you are every in the area. 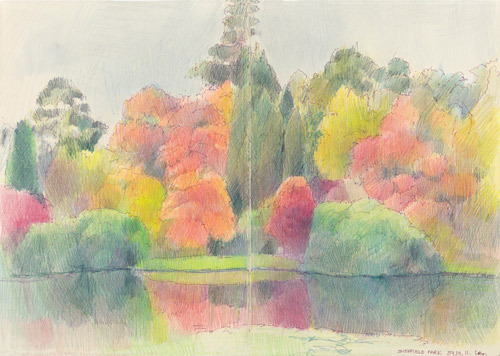 pen and ink and coloured pencil, 11.5" x 16"
Following on from my last post about our visit to Sheffield Park at the end of September (see An Indian Summer (and ice lakes) at Sheffield Park), this is just a tiny sample of the Autumn Colour I saw at Sheffield Park when we visited again at the end of October. I've never come across a National Trust property before which increases its charges to non-members for a specific period of time in the Autumn - but that's what happens at Sheffield Park. "He who must not be bored while I sketch" noticed it on the sign so we were rather glad we'd just had him made up to the other half of a Joint Membership of the National Trust. The garden is 120 acres (49 hectares) and has four lakes which means about a third of it is water. In Autumn it becomes very specicial because it is, in effect, an arboretum - a collection of trees of both native species and ones from overseas. In terms of history, the park was first laid out by Lancelot "Capability" Brown (1716-1783) in the 18th century and was subsequently remodelled by Humprey Repton (1752-1818). There's little indication of they did although it seems likely that Brown cleared some trees and undergrowth to open up the landscape and Repton attended to the part of the garden which is nearest to the house. The first Earl of Sheffield was responsible for the balustraded bridge (1882), the cascade and the Middle Lake. He also started the arboretum. A gentleman called Arthur Gilstrap Soames (1854-1934) acequired the house in 1910 and was responsible for introduction of the vibrant colour in the garden - and all the visitors! 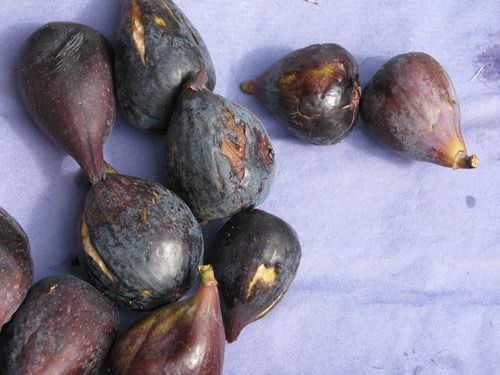 He planted trees which were North American in origin, such as the Tupelo Gum and Scarlet American Oak which contribute signiifcantly to the autumn colour. Other trees which he also planted in abundance included Conifers, cypresses and Japanese maples - with the acers also contributing very significantly to the autumn colour. Clumps of lakeside rhododendrons were planted next to the lakes - and were a favourite of Virginia Woolf - and beds of autumn gentians can be found in the garden. Certainly it's a very fine place to see and to paint in Autumn - particularly given the reflections of the colours of the trees in the water of the lakes. The photographers are also rather keen on it. I think I saw more heavy duty expensive cameras with huge lenses on our visit than I've seen for a very long time. 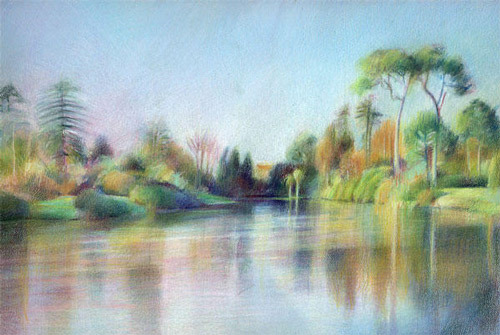 This sketch was done from the north eastern edge of the top lake - looking across the lake. 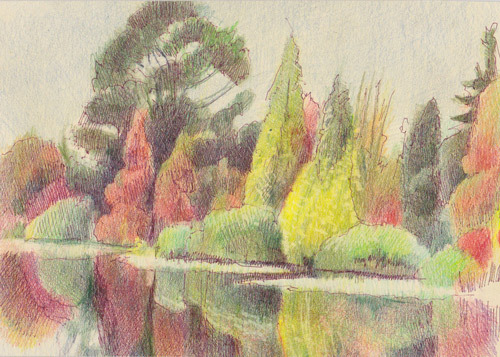 Arboretums are certainly a great place to paint and draw landscapes in Autumn - if they have the right type of trees! At the end of September and beginning of October we raced around the south east of Britain visiting gardens during the wonderful warm temperatures, sunshine and blue skies of an Indian Summer. One of the places we visited was Sheffield Park. pen and sepia ink and coloured pencils - 11.5" x 16"
He also declared Sheffield Park Gardens to be one of his favourite places. The lack of children shouting and screaming on a Friday afternoon being a major bonus! Both views were done from exactly the same place - at the end of the second lake (I forget its name) with the view of the Ice lake being more towards the house and the view at the top looking more towards the northeast side of the Lake. I had brilliant blue skies on both occasions but the temperature varied by 25+ degrees centigrade! pen and ink and coloured pencils, 8" x 10"
On Monday after the lunchtime lecture about Degas at the Royal Academy of Arts (see Degas, Hockney and the freeze frame), here's what my tea looked like in The Parlour on the first floor of Fortnum and Mason. 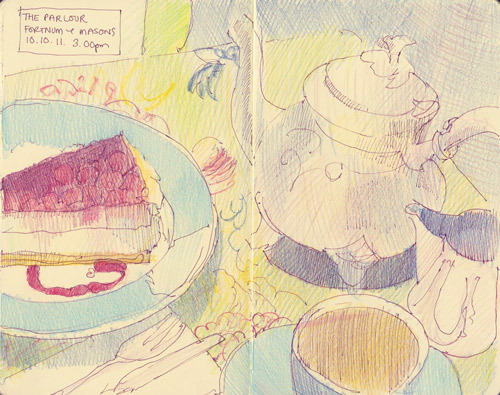 I don't want anybody telling "he who must not be bored while I sketch" that I had a slice of raspberry yoghurt cake! Just keep schtumm! You never saw this! The next sketch is people also enjoying the delights of what's on offer. PS This is getting posted not because it's the next in line in the long queue of sketches which need to be posted but because it's the fastest to create images for. 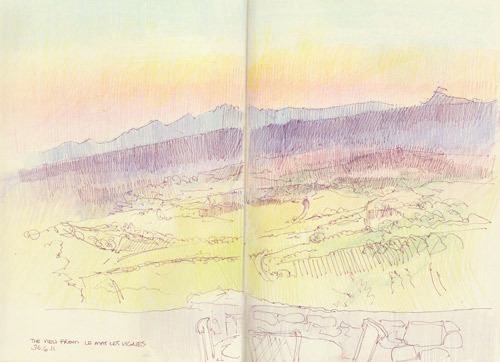 The problem with A4 sketchbooks is that creating images takes that bit longer. I've also got a new handbag from Fat Face which allows me to carry two Moleskines around for notes and sketches plus a my small Derwent pencil wrap and an umbrella - and I've started using it a lot! 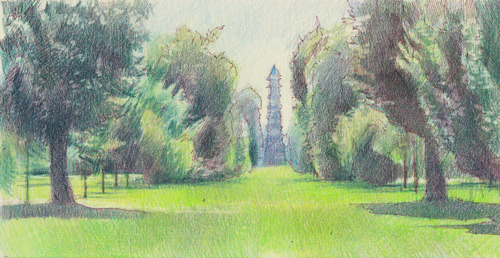 The Pagoda at Kew Gardens on a postcard which is now in California! Pat Reese, who lives in Southern California, now has lots of lush greens from Kew Gardens to look at as my postcard has arrived and was posted yesterday on our blog 'A Postcard from my Walk'. As I commented to Pat, the really weird thing is that the Pagoda is actually a strong maroon crimson shade but it always looks an atmospheric perspective blue whenever it's looked at from the big west east axis which runs across Kew Gardens. On the other hand you'd be surprised how much crimson was required to get those really dark greens (complementary colours can create a very dark colour)! The backlighting makes dark foliage even darker than usual. 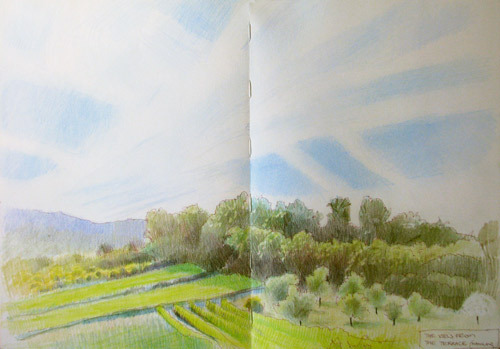 pen and sepia ink and coloured pencils on double page spread in A4 Moleskine Sketchbook, 11" x 16"
Yesterday we went to Sissinghurst. 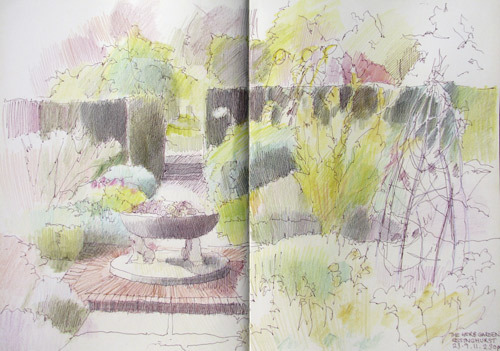 I left "he who must not bored while I sketch" reading The Economist and his latest book about The Eagles, while sat in the Chair in the Cottage Garden while I sketched down in The Herb Garden. Below is the action shot - maybe better described as my "I'm about to pack up and now is a good time to take a photo of the sketch with the pencils I used" photograph! Click the pic to see it open to a larger size which allows you to see the range of pencils I use. This is not finished as I need to work a lot more on the saturation of some of the darker colours - plus I found I'd left some colours at home which I needed for the bright grass greens. Also - after our walk around the lake we went up the tower at the end of the day - and here's a view of some of the garden rooms from the tower. Got to work out how to do a sketch from up there! pen and ink and coloured pencils in Moleskine Sketchbook, 8" x 11"
I was on my own for a couple of days before the others in the Painting House Party arrived and consequently could set my own personal pace around getting up, having breakfast etc. Having arrived on the Saturday afternoon, I had a very sound night's sleep and then woke early on Sunday morning. 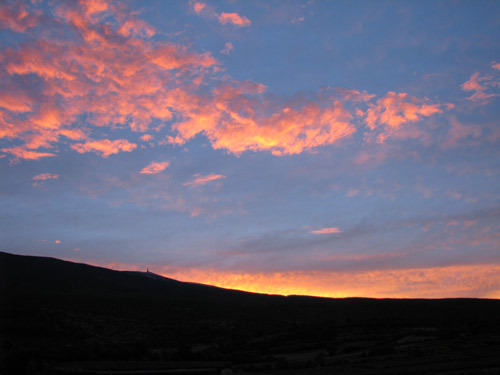 Before I knew it, I found myself standing in the road outside the house at 6am in my PJs so that I could photograph Mont Ventoux as the sun rose! If you look very carefully you can just see the tower on the top of Mont Ventoux in the photo. 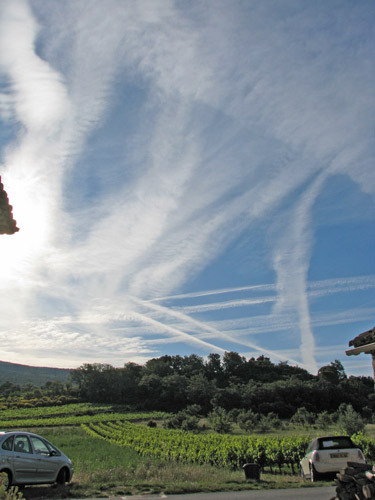 I then had a very leisurely breakfast on the outside terrace while I tried to capture the early morning sky above the vineyards opposite the house. Of course early in the morning the light moves fast - so it actually took me three mornings before I was happy that I'd got the "morning view" right. I should really have done this view in portrait format because the vapour trails on the Sunday morning were absolutely phenomenal - and they kept changing and weren't there at all on the following two mornings! I in no way did them justice with my first sketch in the hamlet. I'm getting there via download of images from SD card to iPad, manipulation in photogene, upload to Flickr, change status to allow download to Julian`s computer and then upload to the post. All the while trying to get used to a French keyboard which is decidedly not QUERTY. 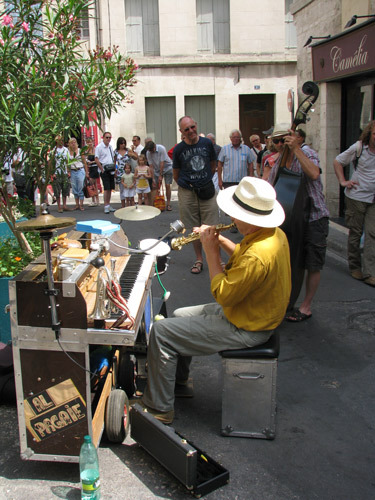 I decided that I could continue posting to Making A Mark - by creating a photo essay of Provence. 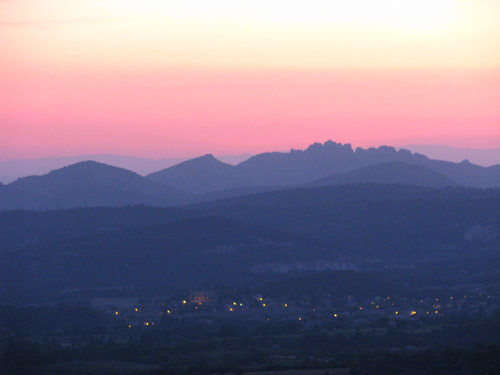 This started with Sunrise over Monet Ventoux. 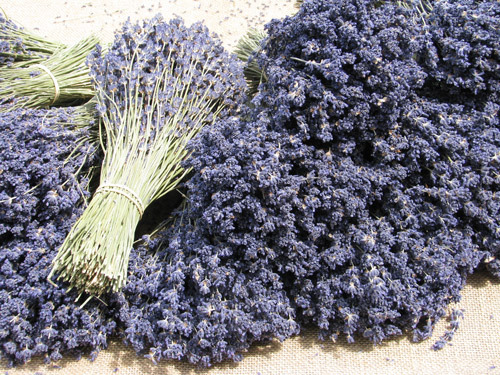 I thought I might try a visual essay of Provence and upload a photograph each day of something that has "made a mark" on me. Next on the list was stocking up the fridge with basics from the Carrefour in Bedoin and then finding somewhere nice to have Sunday lunch!